This page was updated on September 28, 2012. Official, English-subtitled episodes of the 1989 Kimba series, known also as "The New Adventures of Kimba" are being made available on YouTube by Viki, a collaborative subtitle group. As of this writing, the first two episodes of the series are there, but plans are to have all 52 episodes available in the near future. If you're near the Washington, DC area in the next week, you can catch the final performances of Astro Boy and the God of Comics, a live-on-stage homage to Osamu Tezuka, creator of Astro Boy, Kimba, and many, many other characters. The show focuses on Astro Boy, as the title suggests, leaving this Kimba fan a wee bit sad, but the show is obviously put together and performed with love. Divided into 10 "episodes", the show manages to present a good picture of Tezuka the man along with his famous creation, in just 70 minutes. The multi-media presentation is at the Studio Theater, and that link will provide you with detailed reviews of the show as well as the ability to buy tickes. Also added to the history article, in the section titled Watching Kimba Today, are a couple more audio recordings from the same session with the four actors from Titan Productions, revealing how dedicated Kimba fans had to be before Kimba finally came to home video. GENUINE Kimba collectibles are offered at The White Lion Shop. Animation student and fan Hallie R. has some interesting thoughts about more evidence for a white lion in the original draft of The Lion King. It's all on a new page, also linked from the main "Lion King?" page. Ace Bourke who, with John Rendall, owned Christian the Lion in London, made a post to his blog commemorating the 42nd anniversary of Christian's birth. Go read it; he has a lot to say. What makes his post noteworthy here is his mention of "uncanny" similarities between Christian's life and Kimba the White Lion: "their returns to Africa, Kimba with Roger, Christian with us, Kimba in Paris, Christian in London etc." He also says, "I love Kimba!" A great new picture has been added to our page of Kimba pictures. Click the thumbnail to the left to see it! Updates to this site are quietly going on all the time, but it's time to mention a few: The theme song from the Italian series "Una Giungla di Avventure per Kimba" (Kimba's Jungle Adventures) is now on the Music page, new artists and pictures have been added to the Kimba Fan Art Gallery, and there's a new review of an original Kimba episode in the Mailbag! A new page has been added: the Mailbag. This is for Kimba-related items you have written that you feel would make a good permanent addition to this site. Have a look. Please keep in mind that the Mailbag is not your usual message board. Not all letters will be posted. Rules are posted at the top of the Mailbag page. The folks at Rotten Tomatoes did an excellent job of selecting clips to illustrate The Question That Won't Go Away. They call their montage, "Homage or Stealing? You Make the Call." Did you ever wonder about the coloration of Kitty's head and face? Is it just a device to make her look more feminine? Or could it be realistic? A Challenge to See "White Lion..."
This one will be tough, but undoubtedly worth it. 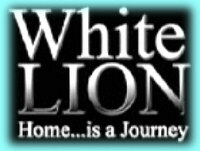 Kevin Richardson's movie, "White Lion... Home is a Journey" opens today (October 15) in just 3 cities in the US: Memphis, St. Louis, and Louisville. Professional movie reviewers are giving it a middling reaction, saying that it's not action-filled enough, but at the same time they say that it is a beautiful movie and emotionally powerful. That means more to me than overblown action sequences. The story is told from the perspective of an old man recounting the tale of the young Shangaan boy, Gisani, and his adventures protecting a rare white lion, a messenger of the gods in his cultural lore. We then see the story of the white lion, Letsatsi, unfold with remarkable close-ups of the lions that portray him and the other animals he encounters. Letatsi is forced from his pride, learns to hunt, and returns to his territory fully grown and ready to claim his due — all the while being stalked by hunters eager to bag such a rare trophy. Kevin Richardson is depending on this movie's success to support the animals at his Kingdom of the White Lion in Africa. So, every ticket you buy will support the animals you see in the film. One reviewer made this puzzling statement, without any explanation: Not recommended if you can recall Kimba the White Lion? I wonder what that means? I have been looking forward to this movie since I first heard about it. The trade magazine Variety predicts that this movie will not get a general theatrical release in the US. I hope they're wrong (in 1977, no one thought Star Wars was worth a wide theatrical release). Grab the chance to see it when you can. 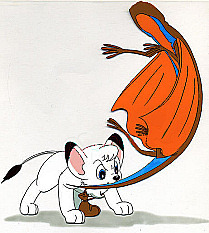 Original Production Cels from the 1960s series of Kimba the White Lion are on sale at The White Lion Shop. These are all one-of-a-kind genuine original cels with new low prices. Check them out! Your picture here? 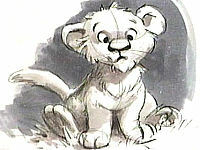 A brand new section has been added to this site: The Kimba Fan Art Gallery! It's currently empty, waiting for all Kimba fans over the age of 13 to send in the pictures you have made of Kimba and his friends. Instructions on how to submit your pictures are on that page. Let's make this a big, beautiful art gallery! 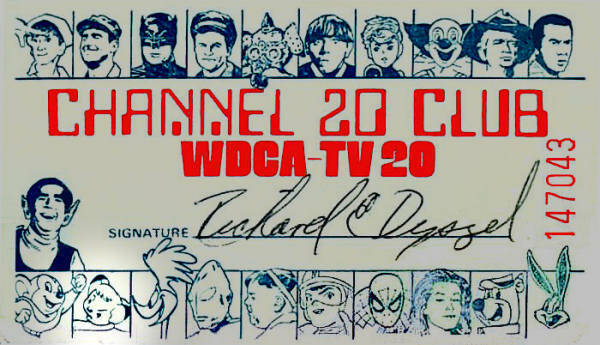 Anyone who watched Kimba in the greater Washington, DC area might remember this: A Channel 20 Club Card, with Kimba shown along with the other great old Channel 20 shows, and Captain 20 right there in the middle! 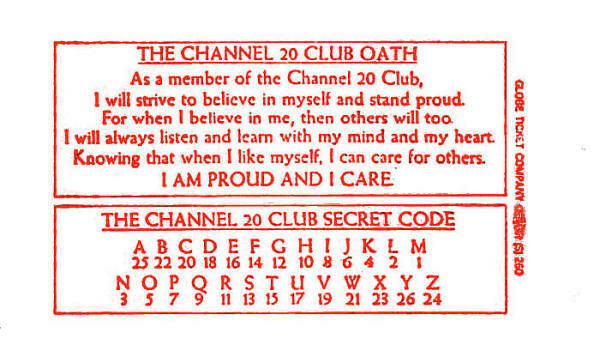 Click on the card to see it without the highlight, and click here to see the back of the card. By the way, the picture of Kimba on the card was taken from the official NBC Enterprises Story Guide, which you can see here. It seems there were some serious problems with the audio player I used. Well, that should all be fixed now, and you should be able to play the theme songs from the 1966 version of Kimba, the 1993 version of Kimba, and all the various songs on my Audio page. Each song should have a little play button you can click. The latest additions to this site came from questions and suggestions. They are a picture of Billy Bully from the episode Catch 'Em if You Can and the theme from Saudi Arabia for the second season of Kimba (aka "Leo the Lion"). 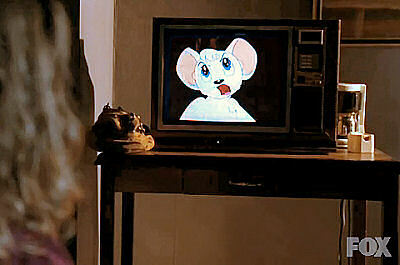 Kimba no longer on TV in the US? With the demise of the Spanish-language television network La Familia, there apparently are no Kimba showings left on the air in the US. Can anyone tell me otherwise? Specklerex: "He doesn't belong! We don't want his kind! Get rid of him!" 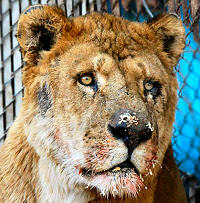 Kimba: "I may have a different color, but I'm still a lion like you!" It's nice to see Kimba making an appearance on network TV --and the original version, too, voiced by Billie Lou Watt & company-- even if it was just a brief cameo. You can see this episode on the FOX web site (click the Fringe logo at the left). 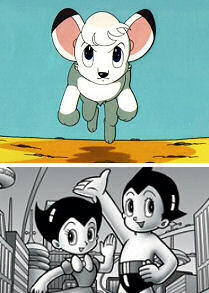 Osamu Tezuka, creator of Kimba the White Lion, is considered the greatest manga artist Japan has ever seen. He drew over 170,000 pages of manga during his lifetime, and produced nearly six dozen television shows and theatrical films. 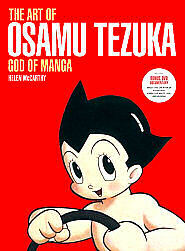 Helen McCarthy, a manga/anime historian, has published a book that documents Tezuka's work over the course of his life. All of Tezuka's signature works are here, from Astro Boy to Kimba the White Lion to Phoenix, along with all the others, presented chronologically. Tezuka's art is also placed in context with Asian and world events. The Art of Osamu Tezuka has 272 pages, and about 350 color illustrations. Included with the book is a 45-minute DVD with a documentary (never-before-aired outside of Japan) covering Tezuka's career in manga and animation. Isao Tomita's Symphonic Poem, based on themes he wrote for the original Kimba/Jungle Emperor TV series, has been reissued in Japan in a new CD + DVD 2-dsic set. Unfortunately, the CD is likely to be a disappointment for English-speaking fans because the new recording has narration (in Japanese) on top of the music throughout the entire recording. This is a significant departure from the older CD and LP of this music, which had a narration track before the music, and the music was entirely in the clear. The DVD is Region 2 only, which means US fans will need a region-free DVD player to play it. The DVD does not contain the animated film of the Symphonic Poem; instead it contains the drawings Tezuka created for the 20-page book included with the original LP release of the music. However, the DVD can be set to play the music without any narration. There are English subtitles to take the place of the narration. The DVD also provides isolated instrumental tracks of the various motifs used in the Symphonic Poem. This new set is part of the celebration of Osamu Tezuka's 80th birth anniversary. 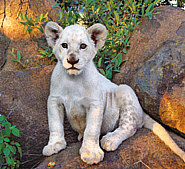 First there was the original Kimba The White Lion. Then came a movie, a second season of the TV show, a completely reworked TV series, an hour-long movie, another theatrical movie, and now in 2009, a TV movie. All these are listed on the All The Other Shows page, which is a gateway to all sorts of neat stuff about each show. The shows on that page are listed in chronological order, and Jungle Emperor Leo 2009 has been added to the bottom of the page. The new page for the 2009 show has a plot summary and all the available information. New character pictures have been added just now! Japan's Fuji Television Network is celebrating its 50th anniversary as well as the 80th anniversary of Osamu Tezuka's birth with a series of new TV adaptations of Tezuka's most popular stories. As part of this series, there was a new Jungle Emperor/Kimba the White Lion movie. 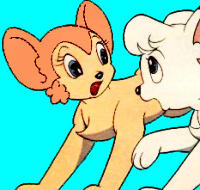 It has been almost 20 years since the previous TV adaptation of this story, and 44 years since Jungle Emperor/Kimba the White Lion first premiered on TV as the first color animated series in Japan. As soon as someone plans an English-language DVD release of this movie, it will be announced here! A project to restore the Leo The Lion TV series is now complete. 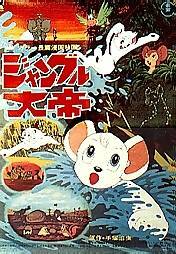 This series is called by some "Kimba: Season 2", and it is the sequel that Osamu Tezuka made in 1966, showing Kimba as an adult. All 26 episodes are now available on DVD, in English, completely uncut for the first time and looking and sounding great. (Previous DVDs of this series have had rotten picture and sound.) Click here for full info. Right Stuf International has released a Kimba DVD "mini set" containing 5 discs with the first 25 episodes from the original series. A mini set offers fans an inexpensive way of enjoying the restored Kimba episodes. You don't get the deleted scenes, you don't get the book from the big box set, and you don't get the next 27 episodes, but you do get the first 25 episodes in all their newly-restored glory. You can order the Kimba mini set from either Amazon.com or Right Stuf International. The Travel Japan blog is reporting that the Seibu Lions baseball team--sorry, the Saitama Seibu Lions baseball team (they changed their name last year)--has decided to change their team logo this year. Their old logo (left), and mascot, which they used for 30 years was the adult Kimba (known here as Leo the Lion). And very handsome he was, too, in my opinion. The new logo (right) shows a lion's paw/hand holding a baseball. I have to agree with the blog writer in the opinion that the new logo is nothing special. Long Live Leo The Lion! Just published is a book by Fred Ladd, the American executive producer of Kimba The White Lion: ASTRO BOY AND ANIME COME TO THE AMERICAS: An Insider's View of the Birth of a Pop Culture Phenomenon , co-written with Harvey Deneroff. The book is Fred Ladd's story of his involvement in producing the English-language versions of Kimba the White Lion, Astro Boy, Gigantor, and other pioneering anime series, and his dealings with Osamu Tezuka and others. It is his personal history of the beginnings of anime for the US. It wasn't as easy as you might think! Available now. Click the picture of the book to order. Any Kimba Fans in England? For the FIRST TIME the 1966 KIMBA MOVIE (picture at left) was shown subtitled in English at the Osamu Tezuka festival in London this past September. Naturally, now that a subtitled version of the 1966 Kimba movie exists, we all hope for a DVD release. As soon as someone steps forward to release this on DVD, it will be announced here! One of Osamu Tezuka's last projects was the film "Legend of the Forest", in which two separate, but related stories are animated in time to Tchaikovsky's 4th Symphony. Two sections of the film were completed, corresponding to the first and fourth movements of the symphony. Now, Anime News Network reports that Tezuka's son intends to create new animation to go with the 2nd and 3rd movements, thereby "completing" the film (it plays pretty good in its "uncompleted" state). The first section of the movie is a both a story and a history of animation, as the characters evolve through the styles of many famous animators from the beginning of movies to the present. The last section of the movie is more conventional, a sort of ecological fantasy. Please note two caveats about the poster shown in the ANN article: The poster is old, and the web address it shows is defunct (it is now owned by some cybersquatter). Also, despite what the poster for the movie shows, Kimba is _not_ in the film. Calling All Australian Kimba Fans! A petition has been started to get Kimba The White Lion back on TV in Australia. If you live in Australia and would like to see Kimba on TV again, click here and add your name to the petition! New: A DVD with 3 "Kimba El León Blanco" episodes from the 1960s. This is NOT the same DVD that is frequently offered on ebay. These Spanish Kimba shows were produced by the same company that produced Kimba The White Lion originally in the 1960s for the US. They have top-notch voice acting (one of the actors sounds to me like one of the English actors; maybe he was multi-lingual) and all the original music by Isao Tomita. All episodes are complete, with nothing cut out, just like when they were first shown. Plus they have a very cool Spanish theme, sung to the tune of the classic English Kimba theme (preview it below). These films are very rare, and it's great to have them available again. It's now available! The most often-asked question about this set is: Does it contain the ORIGINAL 1966 episodes with Billie Lou Watt as Kimba? From Right Stuf head Shawne Kleckner: "This will contain all 52 episodes of the series. The video quality is ABSOLUTELY IMPECCABLE. Everything is remastered and the video quality has NEVER been this good before. The opening and closing are redone, with corrected closing credits that fix the spelling of Dr. Tezuka's name (the original is included as an extra). I think fans will be pleased, the video quality is much better than any previous release." Read my full review of this set by clicking here. You can find links to order your own box set here. The lost version of the first Kimba episode is available. The first Kimba episode exists in two versions, both with the original actors we know and love, including Billie Lou Watt as Kimba. One version was recorded on November 10, 1965, the second on August 29, 1966. It is the first version that has been lost until now. There are some fascinating differences in the dialog, different accents for some of the characters... they were whole different productions. The restoration effort for this lost version has been completed. Click here to read about it and get your own copy. The original Kimba series (original 1966 version) on VHS tapes is becoming harder to find. Check out what's left of these brand-new factory sealed tapes here. Subtitled Jungle Emperor (Kimba) DVDs from China-- Any good? Many fans have been eager to get closer to the original Kimba, hoping for a subtitled-in-English version of the original Japanese shows. A new set of DVDs has appeared from China, claiming to offer just that. It doesn't live up to expectations, though. Click here for a detailed review. On Saturday and Sunday, November 28 & 29, 2009, the New York International Children's Film Festival presented a public showing of episodes of Kimba the White Lion and Astro Boy. More information at the SymphonySpace web site. On Sunday, December 6, 2009, the Freer Gallery at the Smithsonian Institution in Washington DC, screened episodes from three classic Tezuka TV series. This program was part of a month-long exploration of Osamu Tezuka and his works. Public Kimba Screening in Washington DC. The [Washington,] DC Anime Club, in collaboration with the Japan Information and Culture Center, Embassy of Japan, hosted a showing of Jungle Emperor Leo on February 27, 2009. This was part of a new film series based on both anime and manga. 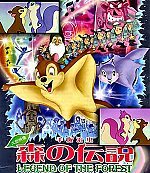 Produced eight years after Dr. Osamu Tezuka's death, this movie is based on his epic "Jungle Emperor" manga. Jungle Emperor Leo tells approximately the last half of the original story. 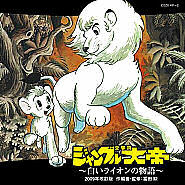 Previously, the first half had been adapted into the 1965 Jungle Emperor TV series (Kimba The White Lion outside of Japan), and the second half had been loosely adapted into the 1966 Susume Leo TV series (Leo the Lion in the US). In some ways, the Jungle Emperor Leo movie is noticeably more faithful to the manga story than the latter TV series had been; in other ways -- most notably the relationships between the animals and humans -- it is very different. You can read more about Jungle Emperor Leo here. The DC Anime Club also hosted a marathon of anime based on the manga by Dr. Osamu Tezuka on December 6, 2008. 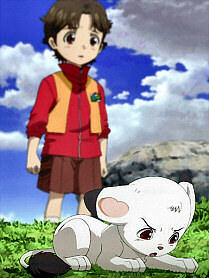 During this marathon such anime as Kimba The White Lion, Phoenix, Black Jack, and Astro Boy was shown. This program was free and open to the public. For more information about the DC Anime Club visit their website at http://www.dcanimeclub.org or call DC Anime Club at 202-262-2083. The DC Anime Club was established in 2003 to introduce and educate people in the Washington, DC area about East Asian culture through viewing and discussion of anime manga. The club also works to provide a positive, alternative activity to the youth in the area by exposing them to foreign culture, encouraging artistic expression and creativity, and providing opportunities for participation in community activities and leadership. The Japanese Embassy, Otakorp, Inc., and the Smithsonian Institution presented the Sixth Annual Cherry Blossom Anime Marathon, including a free showing of Jungle Emperor Leo on April 5, 2008. The other films were: Atagoal: Cat's Magical Forest, 5 Centimeters Per Second, and Appleseed: Ex Machina. Jungle Emperor Leo will be shown dubbed into English; these films were in Japanese with English subtitles. "Tezuka, the Marvel of Manga," a traveling exhibition of the work of manga god Osamu Tezuka, was at the Asian Art Museum in San Francisco from June 2 - September 9, 2007. This exhibition contained original drawings, manga covers, posters, etc., and represented the first time Tezuka's originals had been seen outside Japan. The exhibit was produced in coordination with Tezuka Productions. Tezuka drew more than 150,000 pages of manga, and created more than 500 manga titles and 70 anime titles. Tezuka's images first appeared in print in 1946. He devised many of manga's most distinctive forms and images, and is sometimes credited with almost single-handedly creating the manga and related anime industries. His prolific manga work is often categorized in two ways: manga 'comic pictures' for a young audience, including Kimba, Astro Boy, and Princess Knight; and gekiga 'drama pictures' - more seriously-toned, adult oriented narratives such as Song of Apollo and Ludwig B, that stress realistic effect and emotional impact. This exhibition features both aspects of his work. The 1997 Jungle Emperor Leo movie was released to theaters in France on April 20, 2005. Do you have some Kimba news? Or is there something you would like to see included on this page? Let me know!